The 2017 Honda Accord Sedan brings the LED exterior lighting and deluxe features of prior year’s Accord, like HD Radio, heated outboard seats for passengers, the available Apple CarPlay – and Android Auto compatible 7-inch touch display, and helpful front/back parking sensors. Honda debuts in 2017 the Accord ‘Sport Special Edition’ to the lineup, which has new badging outlining the Special Edition model and heated leather seats with red stitching. Every trim of the Accord Sedan in 2017 is a front-wheel drive setup, and the engine that comes standard (unless chosen differently) is a 2.4-liter, 4-cylinder, that is rated at 185-hp and 181 lb-ft of torque. The 2017 Accord Sedan can be purchased in several trims with both 4-cylinder and V6 engine accessibility. The EX, Sport Special Edition, LX, and Sport sedan trims are standard with a 6-speed manual transmission (available CVT) unless they have the ‘Honda Sensing’ feature set. There is a six-speed automatic transmission, a 6-speed manual transmission, and two different continuously variable transmissions. There is an option for a 3.5-liter V6, which is very strong at 278-hp and 252 lb-ft of torque. If equipped with that engine, it automatically is paired with a six-speed automatic transmission. There are seven trims for the 2017 Honda Accord Sedan, which is a lot to choose from, but in a good way! Any trim will be strong: the LX, EX, Sport, Sport Special Edition, EX-L, EX-L V6, and Touring. On the LX, there are 16-inch alloy wheels, a 4-speaker sound system with a compact disc player, dual-zone automatic climate controls, a USB port, LED tail-lights, an auxiliary audio jack, automatic headlights, and smartphone integration. 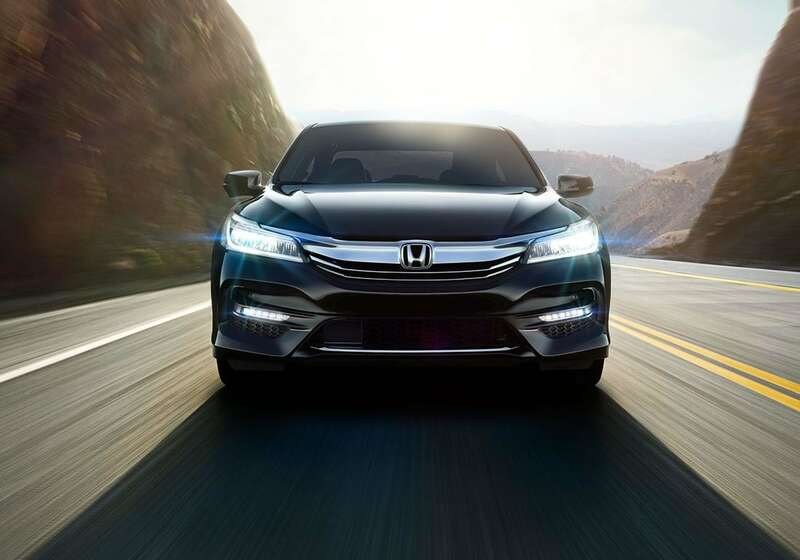 The Accord EX builds on that with heated mirrors, a sunroof, keyless ignition and entry, LED daytime running lights and fog-lights, 17-inch wheels, and 6-speakers for an HD radio and another USB port. Arriving standard on the EX is smartphone app integration, by way of ‘Honda-Link’, plus, Android Auto and Apple CarPlay functionality. Electing the Sport as a trim sees a rear spoiler, LED daytime running lights and fog-lights, supplemental horsepower with the 189-horsepower i-VTEC engine, 19-inch wheels, leatherette bolsters on the cloth seats, an eight-way power drivers-seat, and double exhaust tips, and many other features. The Sport Special Edition comes with red-stitched, heated front leather seats and special-edition red badging. Is there a wireless charger in the cabin? Yes, there can be. There is an available wireless phone charger that creates a cable-free charging zone if selected. Do you regularly have any Service Specials at Bosak Honda Highland? We have great specials going on currently in our Service department: Service Specials! Could you assist me with my trade-in and its worth? Yes, we can! Click here! All 2017 Honda Accord Sedan models get equipped with (ABS) antilock disc brakes, front-seat side airbags, active front head restraints, stability and traction control, side curtain airbags and a rearview camera. Standard on the EX trim (and on any above that) is the LaneWatch blind-spot system- an amazing helper for those hard to see spots! The Sport SE, Sport, and Touring sedans have large front brakes which is sensible for those peppier models. The Accord is also able to be outfitted with (standard on Touring trim) the ‘Honda Sensing’ technology, a part of the set of driver-assistive tech onboard the Accord Sedan. The 2017 Accord Sedan is definitely worth a drive as you search for just the right vehicle. You will be impressed, we’re sure, here at Bosak Honda Highland, stop on by whenever you can!